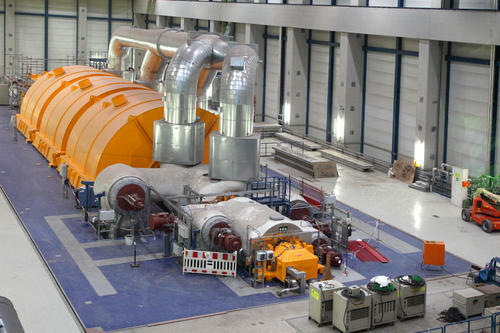 Supercritical steam generators are frequently used for the production of electric power. They operate at supercritical pressure. In contrast to a "subcritical boiler", a supercritical steam generator operates at such a high pressure (over 3,200 psi or 22 MPa) that the physical turbulence that characterizes boiling ceases to occur; the fluid is neither liquid nor gas but a super-critical fluid. There is no generation of steam bubbles within the water, because the pressure is above the critical pressure point at which steam bubbles can form. As the fluid expands through the turbine stages, its thermodynamic state drops below the critical point as it does work turning the turbine which turns electrical generator from which power is ultimately extracted. The fluid at that point may be a mix of steam and liquid droplets as it passes into the condenser. This results in slightly less fuel use and therefore less greenhouse gas production. The term "boiler" should not be used for a supercritical pressure steam generator, as no "boiling" actually occurs in this device.